The perfect Wisconsin & Minnesota getaway! You'll feel at peace and at home at Cedar Ridge Resort. Experience the hospitality of a B&B along with the privacy of your own cottage. You'll be treated to spectacular bluffs & sunsets, & 300 feet of shoreline. 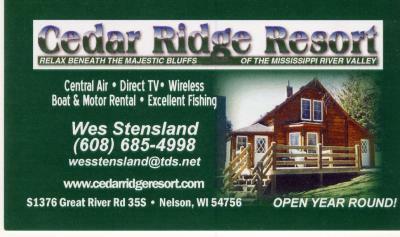 The Ridge is located on highway 35 in Nelson, WI on the Mississippi River backwaters. Nestled at the foot of the bluffs near the Mississippi River, Nelson's Landing RV Park has sites available for the seasonal camper as well as daily and weekly reservations. One hundred newly landscaped RV sites featuring city sewer, water, and electric on 26 acres. Visit our website or call 507-951-2842.